This weekend, 23 June, I successfully completed the UTSW (60). I don't usually write race reports, but there are aspects of the UTSW organisation that I think merits some comment. But before I go there, I have to note that I thoroughly enjoyed the personal achievement I experienced from the event. I ran further than I ever have before, kept my pace consistent throughout, recovered very well from an early down period, managed my own nutrition throughout and was self sufficient, apart from water, for the full 61.61 miles I travelled. I think I've nailed my nutrition, my foot care, and my emotional coping strategies. 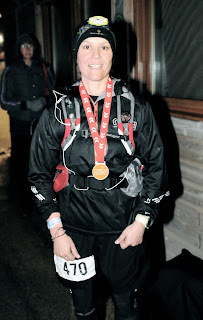 I know my limits and work within them in order to reach the finish line and I am ready to take on what is, in my opinion, the REAL toughest footrace in the UK...the Lakeland 100. The Endurancelife brand feels like a bit of a monster to me. It self proclaims the UTSW to be "The UK's toughest footrace" and the company Director @GaryJolliffe stated in the race briefing that it is their aim to become the UKs UTMB equivalent. from a competitor's perspective, what makes a good event a great event? By nailing this they will achieve repeat custom and a loyal following but it is my experience as a professional and in life that "talk does not cook rice", you need actions to back up your claims. Without question, the UTSW benefits from the stunning setting travelling along the North Cornish coastline, over headlands, across dunes and beaches, through picturesque seaside villages and race HQ is located at the stunning Watergate Bay.But having a great national trail at your disposal is not enough. Value needs to be added. So, using the basic information above as measure of success, the event does not fair well. The distance was pretty much spot on. I got lost so added an extra mile or so to the balance, but this highlights the issue of poor and inconsistent signage along the way. At crucial points on the course - when in sand dunes and in an urban area - the signage ran out and competitors got lost. I have no problems with this and for most events it is par for the course, but you need to be prepared for this and carry a map. I never leave the house without my GPS (it's on my iphone) so once I realised I was lost I could quickly navigate my way back onto the route, but I know that for many others who were reliant on the word of the organisers, this became a bigger issue and for some it contributed to early retirements. Putting a map on the mandatory kit list would resolve this and help manage competitors' expectations. One of the main criticisms I had of this event was that the published approximate elevations (14,000ft for the 60 mile course and 21,385ft for the 100 mile course) seemed to be way off the mark according to the data I collected. I recorded my entire journey on my Garmin 305 and the total elevation for the 60 mile course (with diversions due to getting lost) amounted to 6909 ft. But I've rewritten this paragraph since first publishing the post a few hours ago, because I've since been advised that the Garmin 305 can be unreliable when recording elevation gain and loss. Andy Cole sums up the issue is his blog post - thanks to Tom H, aka @TrailDragon, for drawing my attention to this. His blog is also of interest as he investigates and tests the Garmin on it's accuracy. I had no idea this was an issue. But I do hope that the Garmin is at fault for 2 reasons: 1) the main attraction of this event for me was the tough course and challenging elevation. I thought it would be an ideal final step along the road to the L100 as the distance and elevation, mile for mile, were comparable; 2) The Garmin goes in the bin and Suunto Ambit rises firmly to the top of the Christmas list! However, if the Garmin is not far wrong then the claim of the UTSW being 'the UKs toughest footrace' needs to be rethought / withdrawn. In my opinion, and using comparisons with other events such as the L50/100 which has the same price tag (but 20 quid cheaper because transport is included - and camping etc etc) and the Might Contain Nuts (MCN) events which are cheaper, the organistaion of the checkpoints has really highlighted the lack of thought that went into the organisation of this event. For me this aspect of the organisation set out the Brand as being a money making enterprise that had lost sight of the endurance athletes it is seeking to inspire (as set out in their mission statement). My experience was that the published array of food and drink was not available, but the supplies runners usually carry themselves - gels & Clif bars - were available in abundance! This misses the point doesn't it? In terms of service, assistance and support at the checkpoints, at 4 of the 6 CPs my arrival and departure was hardly acknowledged apart from the mandatory dib in. Support and encouragement were completely lacking, I was not offered food or drink and after dibbing in, CP staff would turn away from me to continue their personal conversations, so I got on with topping up my water bottle and just getting back on the road. I don't really want a big fuss, but I do appreciate it when CP staff celebrate your arrival, acknowledge your achievement so far and make an attempt to look after your nutrition requirements. At the MCN events, it is clear from the outset that CPs provide only water, but the support and encouragement received from the crews is invaluable. They celebrate your arrival and load you up with lots of positive words of praise and encouragement, buoying you up for the next section. The same goes in spades for the L50/100 team along with good hot and cold nutrition options at every stop. As organiser Mark Laithwaite has said about the Recce weekend they run, "If Carlsberg ran checkpoints..."
On balance. I have to mention that the lady at the St Ives CP, and the chap manning the Porthtowan CP who referred to me by my name were excellent and their support and encouragement were very much appreciated. Thanks also to the young boy at Porthtowan who was attentive and offered me food, drink and rushed off to retrieve my drop bag. On a very personal note, when I comepleted the L50 the organisers were there to clap me across the line at 6am in the morning. I was escorted into the hall, someone took my shoes off, I was clapped again, weighed and generally looked after and congratulated. When I crossed the line this weekend, I stood around for a bit, asked where the dibber was and was acknowledged with a comment 'oh, are you a finisher?' then a delayed clap. It didn't have the same emotional impact! Along the way, I spoke to many 100 athletes and without exception they had all found the poor signage and poor CP supplies an additional challenge they had not prepared for. It is my view that this related to the position I took in the field - the middle/back of the pack. I would bet that the elite athletes at the front of the pack had a better experience. But the success of events like the L50/100 which is oversubscribed and growing year by year, is that they balance the need to attract top level athletes with the requirements of the middle and back of the pack runners. Everyone is made to feel that their achievement is equally valued/valuable on the day. All that said, it was a great opportunity to run all day with limited CP support in a beautiful area, meet some great people and be part of the excitement and anticipation that bigger events always create. But there is lots of room for improvement. I may try an Endurancelife event again, but for the moment, give me an LDWA event any day of the week! Very honest article, and I agree with you totally. I have done only one Endurance Life event (South Devon marathon), but after repeated emails to try and find out what kind of supplies would be at checkpoints, with no response, I gave up and carried everything I would need, relying only on water at the CPs. For me, the cost to do a longer event is prohibitive, so any longer challenges I may want to attempt will be purely self (and family! )-supported, or as you say, the excellent value-for-money LDWA events. Thanks for your comment Nick. I usually avoid posting anything negative on the blog because I know that everyone has their own experience, so what is bad for one may be positive for another. But I felt compelled to write about Endurancelife given the entry fees levels and the expectation that they were running a very professional outfit. I had the same communication problems before the event. I emailed the organisers 3 times to seek advice on canceling my entry because I thought I had a diary clash, but I received no reply. I lurked around the Facebook page and saw that others were experiencing the same radio silence, or responses that were unhelpful or defensive. So from the start my trust in the company was on shakey ground. Hence my decision to go in self sufficient mode. I was very glad that I did! From feedback I've received, our experience is not isolated! Lets hope they listen to the feedback. I'm sure the events could be really good. In the meantime I may see you at an LDWA event! I have not taken part in an EnduranceLife event but have heard other people who have had similar issues. Always a bit suspicious of event organisers brand/website which is going to take a lot to live up to. Thanks for writing such an interesting and informative blog post. We are aware that there are many areas for improvement and we are sorry that your experience of the UTSW was less than brilliant. Please be certain that we will use your feedback to make next years event as good as it possibly can be. Out of interest - did you attend the event brief on friday? Thanks for your comment Andrew. I'm really pleased to hear that you will be looking to make improvements next year because I think your event could be really great. I'm not sure if you're planning to email participants to survey them on their experiences or ask for feedback, but I'm sure this would give you a good feel for what needs to be addressed. When your a plodder like me and out on the course on your own for ages, CP support is vital and can really make all the difference between completing and a DNF, particularly for those who may be doing their first long distance event. I did attend the briefing on the Friday - it was billed as compulsory, just as it should be. Let me know if you want any other feedback. I share your views and my experience was the same at the front of the race. I won't be rushing back to do another Endurance Life event. Thanks for your comment Chris. it's a real shame that your experience was no better at the front of the pack. It sounds like they are keen to listen to feedback and make improvements so that's encouraging. We'll have to wait and see! Hi Sarah, I realise this is a late offering but I have just completed the CQ44 race by endurance life. Like many I was impressed by the website and the professional image portrayed. The CQ44 seemed well organised at the check in. The race itself, however, was poorly signposted. I did not get lost as I ran with a repeat racer for some of the way...but I saw others who had gotten lost at crucial turns. Once again, the check points seemed understaffed and they were not always as attentive or encouraging as you would imagine for such a professionally portrayed company. This year was hot - it wasn't a surprise - and when I asked for water to tip over my head I wasn't denied but it wasn't offered either. The finish at lands end was busy with supporters cheering and clapping - the endurance life staff were friendly but there wasn't any recovery food, no seats and all I wanted was someone to hand me cold water. All I got was some warm water which I had to pour myself before attempting to sit on a tarmac floor in order to relieve my legs. As you quite rightly say, the actual events are in stunning locations in a beautiful part of the country - but is this enough? - and truly, are endurance life raising the standard for racers? and learning from the feedback...I am not so sure. Another late reply - I did the UTSW100 in 2012 and had a great time. Yes it was pretty basic in terms of checkpoints and info, but I also think that such events need not involve too much in the way of hand holding. 1) A map (hard copy...no batteries!) - I copied the Harvey Maps and found the course fitted nicely onto 10 A4 sheets which I annotated with CP locations (OK so some changed a bit) and notes in advance. 2) Enough food so that the checkpoints become 'extras' - in the UTSW I took Perpetuem and then topped up with whatever jelly babies etc were available on the way. The 2 'big' checkpoints at Land's End and then at Mile 75 had good enough food for the rest of it. Course marking I actually thought was fine too - and it was pretty tricky to go far wrong provided you kept the sea on your left.